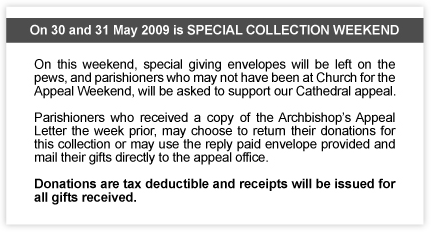 The third and final year of our Parishes & Parishioners Appeal will be launched in every parish in the Archdiocese of Perth on the weekend of the 23rd and 24th of May, 2009. On Cathedral Appeal Weekend, Archbishop Hickey has requested a special DVD be shown at the conclusion of each Mass. 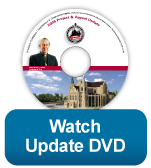 This DVD includes a personal tour of St Mary's Cathedral by the Archbishop and his message to all parishioners. Rev Monsignor Michael Keating, Chairman of the Cathedral Appeal, takes an opportunity to provide an update on the appeal progress and announces that the appeal must raise an additional $7.5 million to complete StMary's Cathedral. 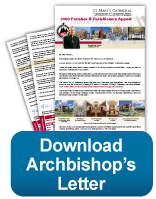 As parishioners leave Church on Cathedral Appeal Weekend, they will be handed a copy of the Archbishop's Appeal letter to take home. In this letter, the Archbishop calls on our Catholic community to make on last, final effort in support of St Mary's Cathedral.